Smyril Line Ferries ticket reservations, ferry timetables and passenger information for Smyril Line Ferries sailing to and from the Faroe Islands sailing to Denmark and Iceland. Booking Smyril Line Ferries tickets has never been easier, compare all Smyril Line Ferries prices in real time and book the cheapest available Smyril Line Ferries tickets to and from the Faroe Islands sailing to Denmark and Iceland online with instant confirmation. Travelling by Smyril Line Ferries is a quick, easy and stress free way to get there and back again. Book you Smyril Line Ferries car or passenger ferries tickets with us and enjoy more choice and flexibility. With the latest Smyril Line Ferries crossing information and timetables for all ferries sailing to and from the Faroe Islands sailing to Denmark and Iceland including information on the ferry ports and useful tourist information about the destinations our detailed route and city maps will help you plot your Smyril Line Ferries ferry journey. If are travelling by car, with your family or as a solo foot passenger book a ferry crossing with Smyril Line Ferries and arrive at your destination refreshed, relaxed and happy. Smyril Line Ferries offers fantastic fares to and from the Faroe Islands sailing to Denmark and Iceland ferry ports. 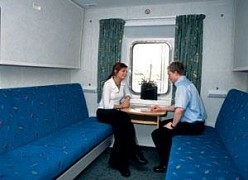 Book Smyril Line Ferries tickets to and from the Faroe Islands sailing to Denmark and Iceland online in advance at Ferryto.co.uk and you will always enjoy our cheapest available ferry ticket price. The price you see is the price you pay. There are no hidden extras or surprises such as added fuel surcharges or booking fees and we do not charge you anything extra for paying with a Visa Electron card. The price we quote you for your selected Smyril Line Ferries route, onboard accommodation and vehicle type is all you will pay, and that's a promise. To obtain a Smyril Line Ferries ticket price and book your ferry ticket securely online please use the real time ferries booking form on the left. Smyril Line was established in 1982 and is today an international company with offices in the Faroe Islands, Iceland, Germany and Denmark. Furthermore Smyril Line is co-operating with agents in the most of Europe and the rest of the world. Smyril Line is a Faroese shipping company, linking the Faroe Islands with Denmark and Iceland. The journey gives you a good opportunity to observe birds, and maybe you'll spot a whale or two. Indoors Norröna has much to offer its guests, and especially in terms of gastronomic experiences. The Norröna operates between Iceland, Denmark or the Faroes. M/S Norröna is one of Smyril Lines newest ship in the North Atlantic. This vessel is the only passenger ship dedicated to operating in the North Atlantic all year round. Over the 28 years Smyril-Line has run sea transport services between continental Europe and the island states in the North Atlantic, the Norröna has become a natural extension of the inter-European road network. Additionally, there are many different activities for you as a passenger aboard. Our well-stocked and expanding tax-free shop on the fifth deck Here you will find a large selection of quality duty free goods. The crossing between Hirshals and Tórshavn takes 38 hours in winter and 30 hours during the summer schedule. The onwards journey to Seyðisfjörður takes another 15 hours excluding a layover in Tórshavn and only sails during the summer schedule. The ferry Smyril M/F has 2-3 daily departures from the ferry port Krambatangi, Suðuroy ferry port, which is located on the opposite side of the inlet. The trip from Tórshavn to Tvøroyri takes 2 hours. The ferry takes 200 cars and 975 persons. It is possible to go by bus from the harbour of Krambatangi to all other villages on the island. There are currently two public bus-lines, number 700 goes to the southern part of the island with the end station in Sumba and line 701 which goes to the villages in the northern part of the island. The end stations are in Sandvík (the northernmost villaeg) and in Fámjin, which is on the west coast of Suduroy. Best Price Guarantee - We always offer you our lowest available Smyril Line Ferries ticket price and there are no hidden extras or surprises such as added fuel surcharges or booking fees and we also we do not charge you anything extra for paying for your ferry ticket with a Visa Electron card. The price we quote for your selected Smyril Line Ferries car or passenger ferry ticket, onboard accommodation and vehicle type is all you will pay for your ferry ticket, and that's a promise! In the unlikely event you find the same all inclusive Smyril Line Ferries ticket cheaper in the brochure of any other tour operator we promise that we will do our best to beat that price or offer you the choice of requesting a refund. To book Smyril Line Ferries tickets please click here. Discounted Group Travel with Smyril Line Ferries - Ferryto.co.uk offer a dedicated personal and affordable Smyril Line Ferries group and coach party ferry passenger reservation service offering you the lowest available ferry rates. Our specialist Smyril Line Ferries group travel team will secure the best deal for you and your passengers. The only requirement to qualify for discounted group travel ferry rates is that your party should be at least ten people and travel at the same time. For more information about group travel on Smyril Line Ferries please click here. Ferry Logistics offer a personal and affordable Smyril Line Ferries freight and cargo ferries reservation service to and from the Faroe Islands sailing to Denmark and Iceland. In addition to offering preferential rates to commercial operators and haulers Ferry Logistics is now also able to offer discounted ferry freight rates to private customers such as those wanting to take transit vans on any of the Smyril Line Ferries routes serviced. For more information and an instant online quote for your commercial vehicle ferry crossing please click here. At ferryto.co.uk you are able to obtain live Smyril Line Ferries ticket prices, check availability, view ferries timetables and book Smyril Line Ferries car and passenger ferry tickets at our lowest available ticket price. Ferryto.co.uk is part of the world's largest online ferry ticket distribution network providing the ability to book over 80 major European ferry operators including with Smyril Line Ferries to over 1,200 ferry routes throughout the UK, France, Spain, Ireland, Holland, Eastern Europe, the Mediterranean, the Baltic and North Africa. Choose Smyril Line Ferries ferries for the cheapest ferry ticket prices to and from the Faroe Islands sailing to Denmark and Iceland.